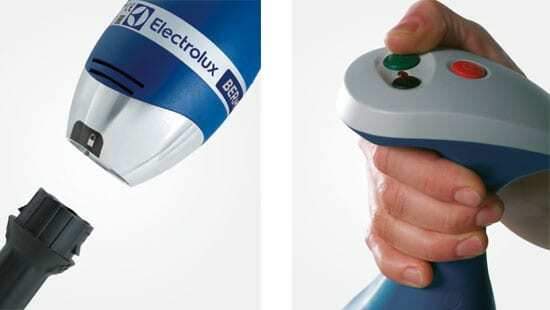 Prepare soups, purees, sauces, creams and whip egg whites quickly and easily with the Electrolux Bermixer Pro. This name is inspired by the brand name of the specialized commercial equipment, manufactured by the official Dynamic Preparation branch of Electrolux. Immersion blenders are an essential tool for any commercial kitchen and have been utilized for over sixty-five years. A Swiss man by the name of Roger Perrinjaquet invented the first immersion blender and called it the “bamix.” This word derives from the French term, “bat et mixe,” meaning to beat or mix. This piece of equipment is a kitchen cutter used to blend ingredients or purée food in the container in which they are prepared. Their uses include, but are not limited to: puréeing soups, emulsifying sauces, and preparing refried beans. The product quickly became popular throughout Europe, but it was not until the 1980s that the mixer was introduced into the United States. 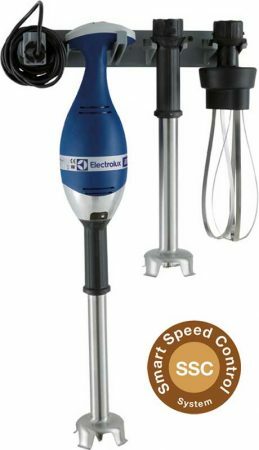 The Dynamic Preparation branch of Electrolux exclusively produces the Bermixer, a high-quality commercial immersion blender. Exceptionally light: Less than 9 lbs (4 kg)! The tube attachment is ideal for the preparation of creams, soups, sauces, vegetable purees, pancake batter, and mousses. The whisk attachment is ideal for whipping creams, beating egg whites or making mayonnaise. Electronic speed variation from 500 to 10,000 rpm with full load. SMART Speed Control: Auto-regulation of the power based on the load consistency to ensure a longer life and reduced vibrations. Tube, shaft and blade are easily disassembled without tools. A special wall support holds the unit and tools, when not in use. User presence switch safety feature means user must keep pressed for continuous operation. 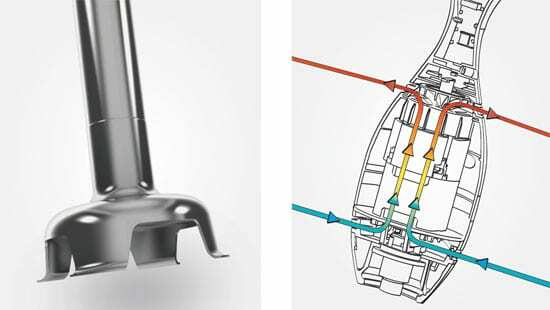 Double-fan air cooling system guarantees longer working time without overheating. Overload alarm indicator in the control panel will light if the unit is used improperly. The special lipped design provides protection from blade and eliminates splashing. Ergonomic handle for a comfortable use. Visible control panel with speed adjustment and warning light. Flat motor base connected to the tube via “Bayonet” system. All the parts in contact with food are 100% dishwasher safe.